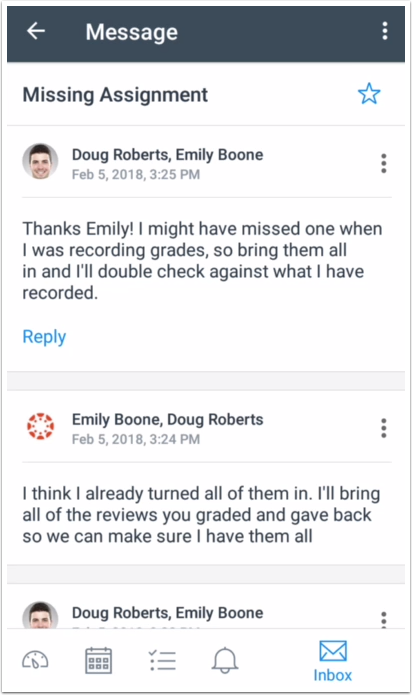 How do I view the Conversations Inbox in the Student app on my Android device? 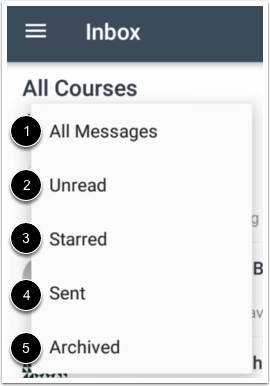 Canvas lets you access your conversations on your Android device so you can keep in touch with people in your course at any time. 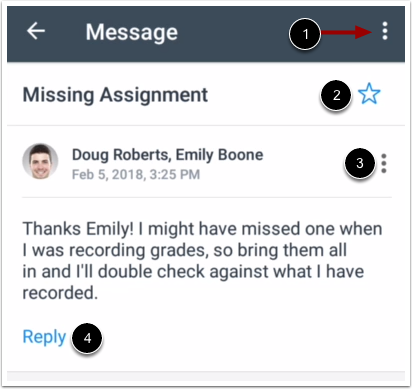 Unlike the web version of Canvas, you cannot view assignment comments from your instructor in Conversations. However, you can view comments in the assignment. The mobile version of Canvas supports the ability to star a conversation. However, it does not currently support a filter option to view starred messages. Any messages that you star in the app can be viewed in the starred filter in the web version. In the Navigation Bar, tap the Inbox icon. 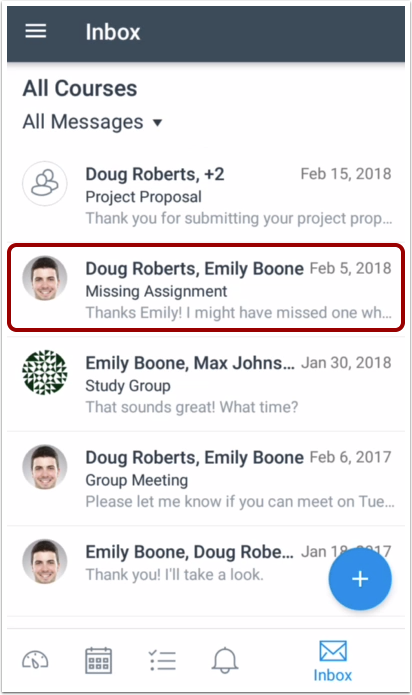 The Conversations Inbox folder displays all messages you have received and is organized the same way as the browser version of Conversations. Messages are arranged in chronological order—newer messages appear at the top, and older messages appear near the bottom. Unread messages are indicated by a blue dot. Swipe your device from top to bottom to quickly refresh your messages. You can view different types of messages. To filter what displays in the inbox, tap the Arrow icon. The default view is All Messages , which shows all types of messages. If you only want to view messages you haven't read yet, tap the Unread option . To view messages you have starred, tap the Starred option . To view all your sent messages, tap the Sent option . To view messages you've archived, tap the Archive button . Note: Some filters may not apply to any messages. To view a message, tap the message you want to open. View the selected message thread. To reply, reply all, mark as unread, forward, archive, or delete the entire message thread, tap the message Options icon . To star the message, tap the Star icon . To reply, forward, or delete an individual message in the thread, locate the message and tap the Options icon . To reply to the message, tap the Reply link . 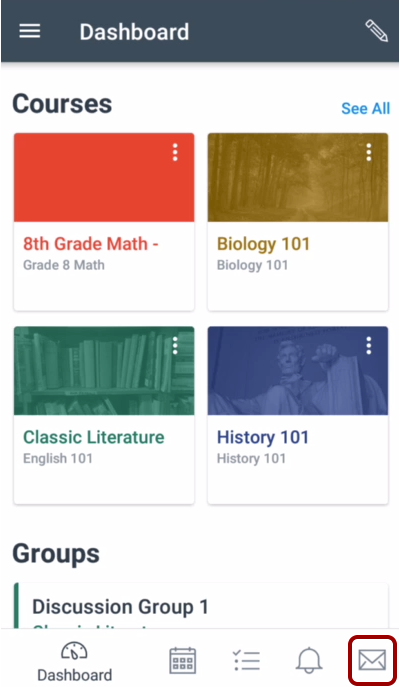 Previous Topic:How do I create a new calendar event in the Student app on my Android device? 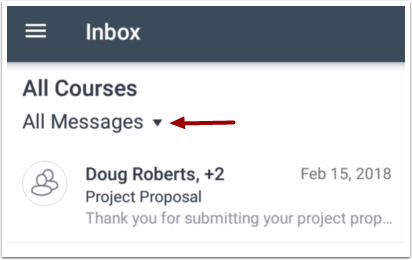 Next Topic:How do I send a message in the Student app on my Android device? Table of Contents > App Features > How do I view the Conversations Inbox in the Student app on my Android device?